This hand colored map is a steel plate engraving, dating to 1814 by the important English mapmaker John Thomson. It depicts France divided into its color coded provinces. Until 1790 France was divided into 40 provinces based on local loyalities and feudal histories. 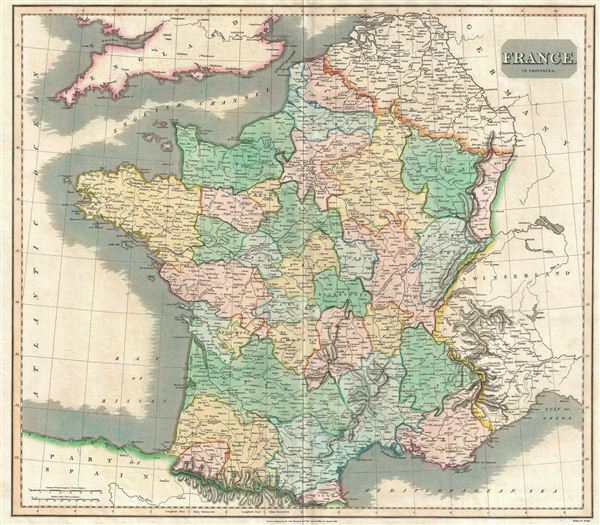 On March 4th of 1790 the National Constituent Assembly reorganized the Provinces into 101 departments, but old habits being what they are, many maps, including Thomson's, continued to depict the provinces of France well into the 20th century. Thomson maps are known for their stunning color, awe inspiring size, and magnificent detail. Thomson's work, including this map, represents some of the finest cartographic art of the 19th century. Engraved in 1814 by James Kirkwood and issued as plate no. 18 in Edinburgh cartographer John Thomson's 1817 edition of the New General Atlas. Rumsey 1007.023. Phillips (Atlases) 731. Newberry Library: Ayer 135 T4 1817.